Who doesn’t want to have a healthier home and/or work environment? Parents of young children are familiar with those long stretches of time when a cold or other virus sweeps through the whole family. Office workers try to keep their hands washed to avoid catching whatever is going around the office. 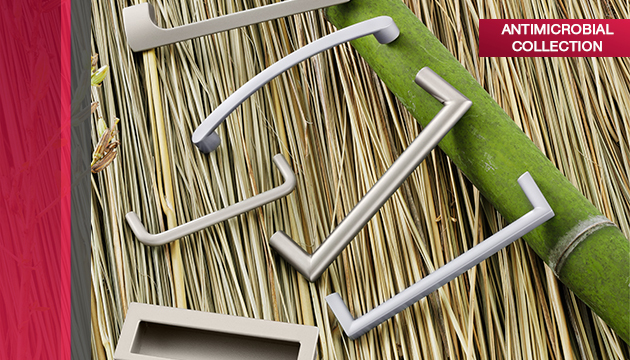 Now Häfele declares they have decorative hardware that can help fight the ongoing battle against germs. Where health and hygiene are important considerations, pulls & handles with antimicrobial finish are now available in a choice of six distinctive pulls and handles. Häfele’s Antimicrobial Collection starts with exceptional craftsmanship and contemporary style. Then a durable, powder-coated antimicrobial finish is applied that reduces the possibility of developing “superbugs” or other strains of bacteria. With today’s health and hygiene concerns, this collection offers new possibilities for residential, commercial and institutional applications. Whatever your decorative hardware priorities, Kitchen Views offers a wide selection of brands to complement your cabinetry, your style and your budget. Looking for a fun little do-it-yourself project? Why not spruce up your kitchen or bathroom vanity before the holidays? 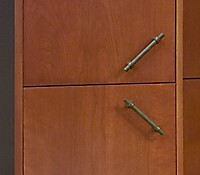 Come into any Kitchen Views showroom to see our wide selection of affordable decorative hardware. You can easily swap out knobs and pulls yourself to give your kitchen a little lift. Our showrooms offer a wide selection of knobs and pulls ranging from the whimsical to the traditional. Come in to a Kitchen Views showroom to see what works best for your kitchen or vanity. Knobs are easily switched out. But if you’re replacing a handle or pull, be sure to bring in an existing piece to be certain the spacing for screws is the same. You wouldn’t want to get home and find that you would have to drill a new hole and cover the old one. To see some examples of what Kitchen Views has to offer, read Brandy Souza’s blog post, “Tiffany’s Never Had it So Good.” You can also check out the Kitchen Views web page about decorative hardware.